If you go to Amazon and type in ‘Ichimoku’, you’ll get inundated with all the various Ichimoku books and e-books. There are some really, really horrible self-published ebook only ones on Amazon that do nothing but shill out the same crap without any really good education and 99% of them ignore the time, price and wave theories in the Ichimoku System. If you’re going to get any kind of book, I would recommend Ichimoku Charts: An Introduction to Ichimoku Kinko Clouds by Nicole Elliot (she’s just awesome, she actually traded the system in Japan and was taught by some phenomenal Japenese traders). Another equally awesome book is Trading with Ichimoku: A practical guide to low-risk Ichimoku strategies by Karen Peloille. And finally, part of the Wiley Trading library, Trading with Ichimoku Clouds: The Essential Guide to Ichimoku Kinko Hiyo Technical Analysis by Manesh Patel. It is Mr. Patel’s work that I will be referencing today. There are 5 strategies that Mr. Manesh Patel wrote about in his book. I have found all of them to be extremely effective, depending on your time frame. I really do believe that following these rules as part of a Ichimoku system is a phenomenal way to begin building a profitable system. Strategy #1 – Ideal Ichimoku, the foundation strategy. Conversion Line > Base Line. Conversion Line < Base Line. Cloud ahead is red (Span A < Span B). Strategy #1 – The TK Cross Strategy. This is really a moving average crossover system of the Conversion Line (Tenken-Sen) and the Base Line (Kijun-sen). Price is above the cloud or a certain distance below a nonthick cloud, as long as the cloud is a thin cloud. Thin clouds represent weak areas of support and resistance – they are easy to move through. I do need to note something here – The distance is going to be determined by the timeframe. What has always worked for me was to look for extreme moves away from the Base Line and determine what an ‘average’ would be – then divide that by 2. For example, on a 1-hour Bitcoin chart I look for a distance greater than 250. Look forward 5-10 candlesticks and if the Lagging Span won’t enter or hit a candlestick, then it is in open space. Also, look below the Lagging Span and make sure it won’t soon enter or hit a candlestick. Price, Conversion Line, Base Line and Lagging Span should not be in the cloud. If they are it should be a thick cloud. Optional: Cloud ahead is green (Span A > Span B). Optional: Cloud is not thick. Price is below the cloud or a certain distance above a nonthick cloud, as long as the cloud is a thin cloud. Lagging Span in open space. Price, Conversion Line, Base Line, and Lagging Span should not be in the cloud. If they are it should be a thick cloud. Optional: Cloud ahead is red (Span A < Span B). Strategy #3 – K Cross. Patel wrote that this was the ‘day trading’ strategy and represented the lowest risk. However, low risk also means a lower probability of success. With strict discipline and consistency with leaving losing trade when you should, it has a high profitability potential. Price crosses above Base Line. If Conversion Line < Base Line, then Conversion Line should be pointing up and the Base Line should be flat. Or, Conversion Line > Base Line. Span B is flat or pointing up. If Span A < Span B (red cloud ahead), then Span A must be pointing up. Price not far from Conversion Line or Base Line. Price crosses below Base Line. If Conversion Line > Base Line, then Conversion Line should be pointing down and the Base Line should be flat. Or, Conversion Line < Base Line. Span B is flat or pointing down. If Span A > Span B (green cloud ahead), then Span A must be pointing down. 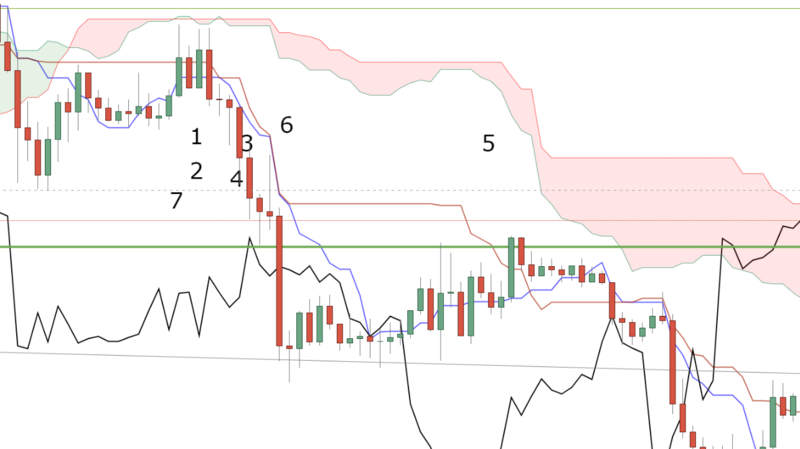 Strategy #4 – Kumo Cloud Break. Patel wrote that this was his least favorite strategy. Price crosses above the cloud. In Conversion Line < Base Line, then Conversion Line should be pointing up while Base Line is flat. Or Conversion Line > Base Line. 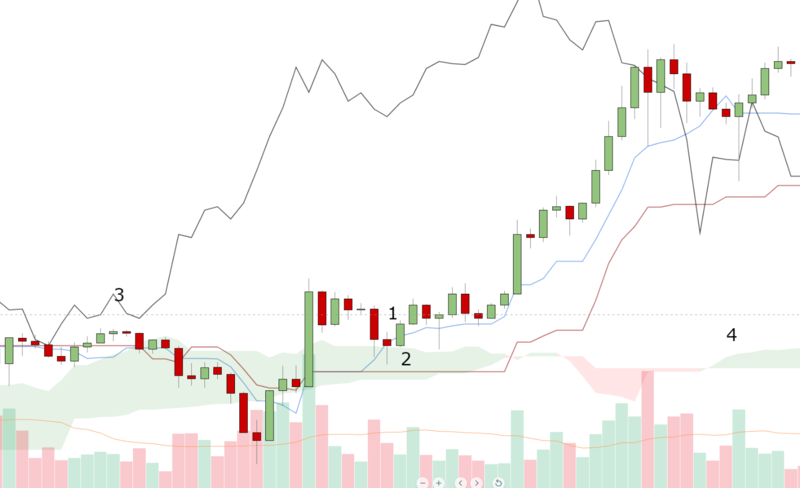 Price crosses below the cloud. In Conversion Line < Base Line, then Conversion Line should be pointing down while Base Line is flat. Or Conversion Line < Base Line. Patel wrote that this strategy was interesting and time-based, but that he did not find it useful by itself, but implementing it along with another strategy was useful. Span A > Span B (green cloud). 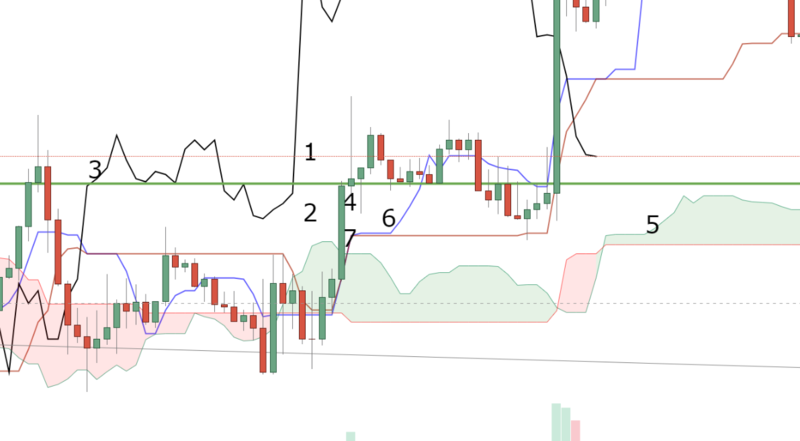 Price closes above the Cloud. If Conversion Line < Base Line, Conversion Line must be pointing up while Base Line is flat. Span B not pointing up. If Span A is < Span B, then Span A must be pointing up. Optional: Future Cloud not thick. Span A < Span B (red cloud). Price closes below the Cloud. If Conversion Line > Base Line, Conversion Line must be pointing down while Base Line is flat. Span B not pointing down. If Span A is > Span B, then Span A must be pointing down.